About this spot: Legendary rocker and U2 frontman Bono once left his mark here with the graffiti words "Rock 'n' Roll stops traffic". With its 40-foot height and 710-ton weight, this concrete fountain makes an impact with its sharp geometric form and gushing water. For the wedding couple who isn't afraid of an avant-garde backdrop, the Vaillancourt Fountain is a location that makes a bold statement. About this spot: The Palace of Fine Arts brims with romance, transporting you to another time and place. No wonder so many couples come here to take wedding photos. Designed for the 1915 Panama-Pacific International Exposition, the architectural style of the Palace is reminiscent of the grand entrances and hierarchical elements of the Roman era. On the grounds of this neo-classical Palace, you'll find plenty of photo ops amongst the towering Corinthian columns of the Rotunda and the waterfall of the swan inhabited lagoon. An early morning or late afternoon shoot will be best to bring out the earth-tone colors of the pillars. About this spot: The Conservatory of Flowers, a white painted-wood and glass structure, provides the perfect backdrop for wedding day photos. On the grounds in front of the conservatory, you'll find flowers in full bloom during the spring. Even during a fall wedding, you can still capture the beauty of the surrounding trees and statues nearby the building. It's worth noting that Sunday road access through Golden Gate Park is limited, so plan accordingly. About this spot: There's no reason why all wedding photos have to be serene and mainstream. One way to add a unique flavor to the backdrop of your wedding day photos is to visit the Mission district, where there are over 200 murals to choose from. Possibilities include the "Music and Flowers" mural at 21st and Mission Street, the "Dream" on Bartlett and 21st Street, or a vibrant vertical mural depicting three different subjects, located on Balmy Alley. You can check out some of the works of art and their locations online at www.precitaeyes.org. About this spot: For some, nothing elicits a more breathtaking, romantic image of San Francisco than the Golden Gate Bridge itself. The striking vermilion-colored suspension bridge has a main span of 4,200 feet, connecting San Francisco to Marin County. 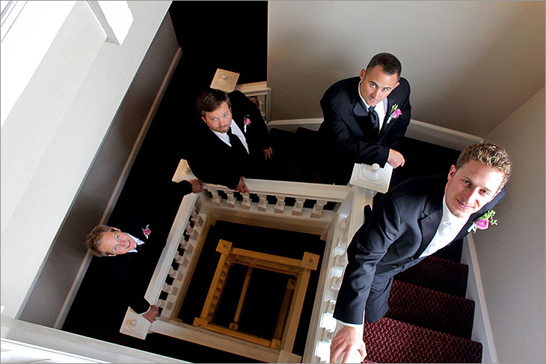 Year round, you can capture great wedding shots with the bridge anchoring your photo. Generally, October through March, you should be able to get a clear shot of the bridge. The summer months tend to be the time when the dense fog rolls in. On the San Francisco side of the bridge, Battery Cranston (created in 1897 to defend the city's shores from warships) offers a splendid view of the Golden Gate Bridge. Another place you can get a great shot is during mid-morning at the Visitors Center. A good vantage point would be the bus stop, which is above the car park area. About this spot: If you want to add a little European flavor to your wedding album without actually venturing out of the country, one place to capture the perfect shot is at the Dutch Windmill in Golden Gate Park. No longer in operation, the windmill used to pump water from an underground well into the Stow Lake reservoir. For optimal lighting, you'll snag the best shots of this architectural piece in the morning. (In the late afternoon and weather permitting, don't forget to get a gorgeous view of the Ocean Beach sunset). The windmill is located right behind the Queen Wilhelmina Tulip Garden, which will add some eye-candy pop to your photos. During the springtime, you'll find the colorful native Holland tulips in full bloom. About this spot: What's more San Franciscan than a cable car ride? For a fun photography moment, you and the wedding party can hop on the cable car for $5 a person. Or if that seems like too much work, just capture the cable car in the background instead. You can get a great shot of the cable car traveling downhill with a view of the Victorian homes in the back at North Point on Hyde Street. Opt for an oncoming shot of the cable car going up the hill on California Street and Powell with the Transamerica Pyramid in the background. Or get a great photo of the cable car facing west at the California Street Turnaround by Market Street. 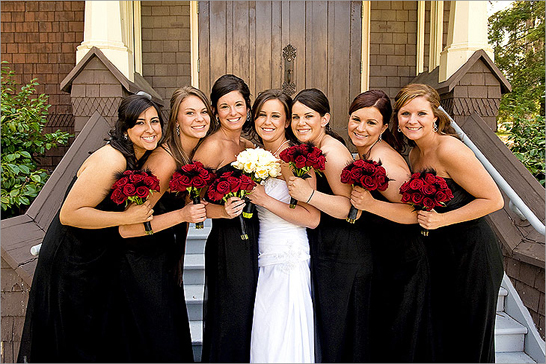 About this spot: If you don't want to have to schlep your wedding party all around the city just to take a few photos, there are many memorable spots to choose from in the six blocks of Hyde Street between Jefferson Street and Lombard Street. Off this stretch of Hyde Street, you have access to the "Crookedest Street in the World," with opportunities to photograph your entire wedding party on eight switchbacks amongst full bloom Hydrangeas in May. Early morning will get you the best shots on Lombard. Besides the cable cars, you can also get photos with Coit Tower in the background. Or you can venture out to nearby Fisherman's Wharf.